We had a lot of fun when we first moved here, playing with literal translations of some of the Spanish names. Both of my kids had Spanish classes in their Hoosier school, and I tried teaching them as much as they would let me. Flash back to The Girl, two years old, putting her hand over my mouth after a day of hearing nothing but French, saying, “No more words, mommy.” Needless to say, foreign language lessons chez nous didn’t get too far. Tonight we hit a new-ish restaurant in Mira Mesa (“Look! Table!”). There are several newer joints tucked into the same shopping center here, and all had a wait of at least 30 minutes. Except Bruski’s. Even though that doesn’t bode well, we went with it. One of us should have pointed at Bruski’s seating availabilities and said “Look! A Table!” I hate it when I miss a good bad joke. Great beer selections, good chicken wings, The Boy approved of his standard Meat-Cheese-Bun Only burger, and we were happy enough to say we’d come back to try the mac and cheese. I had a Cobb salad that at a half order could have fed four people, and the bacon on it was dee-lish. The Husband was disappointed with the dry chicken on his Caesar salad. His Honey Chipotle wings tasted mainly of honey and were all right, but I think my naked wings were better. 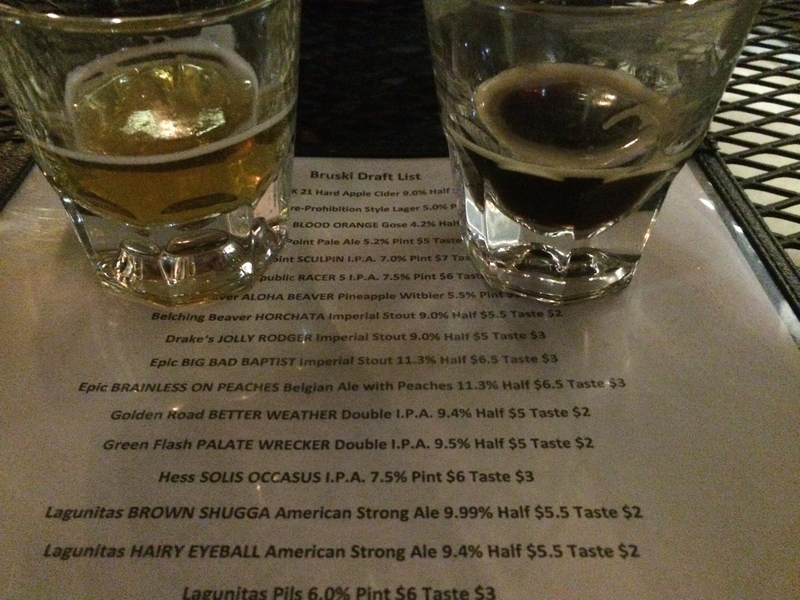 Two tastes of beers from Bruski’s- Belching Beaver HORCHATA Imperial Stout and Epic BRAINLESS ON PEACHES Belgian Ale. Both were too sweet for me. Next time it will be Epic Big Bad Baptist Imperial Stout, because of the name, seriously. And Onion Rings, baby. Mama needs her fried food.